Meet the immaculate "Velocity," a used 88' Sunseeker fully loaded : Atlantic Yacht & Ship, Inc.
Meet the immaculate “Velocity!” She is a used 88′ Sunseeker built in 2010 loaded with options and upgrades. Built to MCA specifications and maintained by a meticulous captain and knowledgeable owner. She has a four stateroom/ five head layout which includes a day head plus crew quarters for four. A favorite feature of this lady is her heated floors and towel racks in all four private heads on guest level. Yes, I said heated! Not only are you wrapping yourself in a nice warm towel after your shower, but also stepping out on to a warm floor. 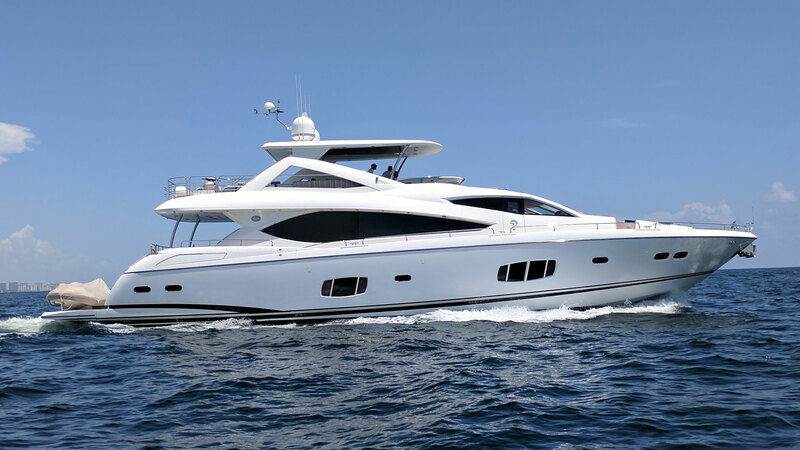 The main saloon and galley on this used 88′ Sunseeker has a sleek style that are perfect for entertaining. Each area of the yacht is impressively spacious and accommodating for all your guests. There are many locations on the yacht for comfortable sun bathing including the the fly bridge and fore deck. Additionally, she includes a davit on the fly bridge and a high/low platform for water toys. Equipped with a 25 KVA frequency converter which allows for worldwide travel. She will be sure to stand out at night with coordinating Cantalupi LED lighting throughout the yacht that can dim to your desire. For more information on this used 88′ Sunseeker contact Stephen Faraldo today at Atlantic Yacht and Ship.